How three individuals in pre-contact America gathered the warring nations together and created peace that lasted until the advent of the European. They established a society of no poor, no orphans, and no jails. They established the only true Democracy on the face of the Earth, and the First United Nations laying the foundation of our Constitution. Exhibit 1: Great Laws and Prophecies of the Iroquois. The panels have the art printed on canvas with the printed story below. This is a nice presentation for museums or information centers or casinos. It is easy to install. Viewers can take their time to enjoy the stories and the art. Perfect for festivals. 30 framed originals presented through a small booklet with the stories. Best for art museums and touring art exhibits. This exhibit includes 30 original paintings by the artist and features many items from a Living people, the Haudenosaunee or Iroquois. 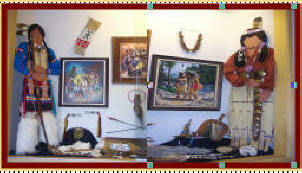 Six complete Traditional Clothes as well as musical instruments, and baskets. Your organization can bring this presentation to your community. Use it as a fundraiser, or just to educate. The art works are colorful and detailed, while the oral recitation is dramatic and passionate. Learn about the Indigenous peoples of North America from their own history and how it influenced ours.